Union Youth is the youth ministry of UBC. Through the efforts of this ministry, we are able to provide a positive supportive environment for children, youth and young adults. Union Youth provides a positive, nurturing experience for infants and preschoolers, children (ages 5-12), youth (ages 13-18) and young adults (ages 19-30) within Union and in the community. Various activities are designed to assist youth in growing spiritually and academically. Some of the activities include Nursery, Children’s Church, Youth Group, field trips, retreats, camps, and Chosen Generation Choir. Christian Life Skills seeks to prayerfully equip persons who desire to assist others in living spiritually healthy and productive lives through: teaching, training, mentoring, modeling, nurturing, and networking in the context of churches, educational institutions, and community settings. 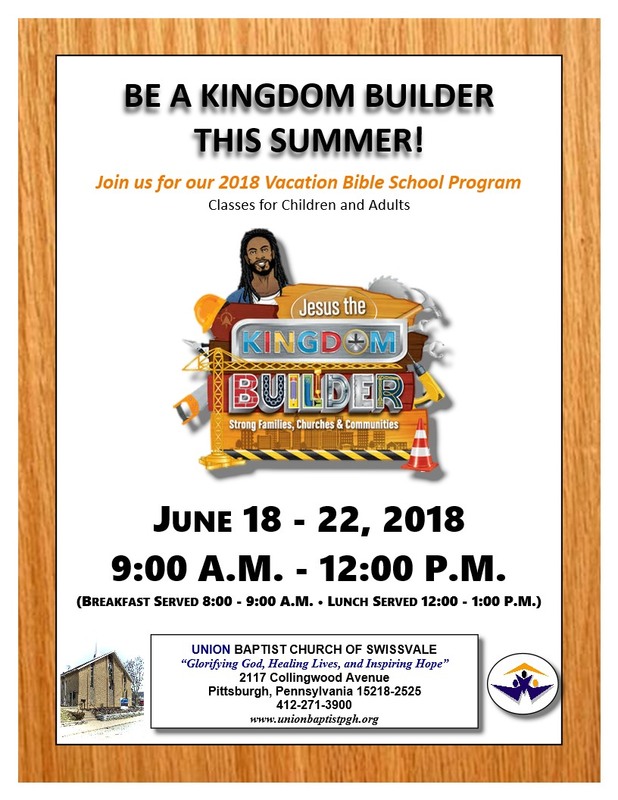 To register – Please contact the church office at 412.271.3900 or complete the VBS Student Registration Form 2018 Edited and submit it to the church office.